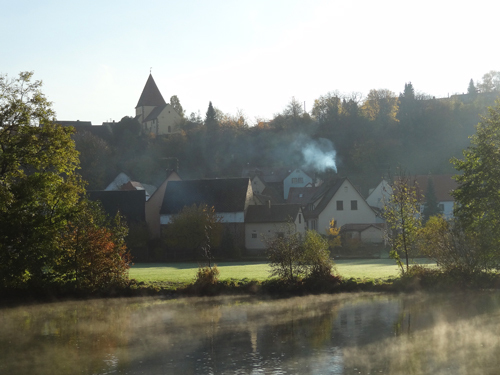 Editor’s note: This article is the second part of the series on river cruising. The first, River Cruising on the “Best in the World”, appeared last week. I arrived by train in Vienna mid-day Saturday, and took a taxi out to where my river-cruise ship, the 140-passenger MS River Harmony, was moored in the Danube. 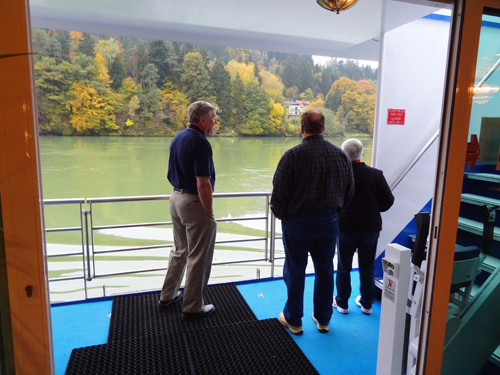 Having spent the better part of a week in western Austria’s Lake District, I was looking forward to this river cruise, not since it offered a change in scenery but because it was something I had never experienced before. The concept of experiencing a different inland destination every day without ever touching a suitcase was intriguing, but I also wondered how reality would compare to the publicity and other promotional hype I had heard about river cruising in Europe. In two weeks, when we reached Amsterdam after sailing almost 1000 miles on the three largest rivers in Europe, I would have my answer. We cast off from Vienna in the middle of the night setting sail for the Wachau, one of the most scenic stretches of the Danube, and the town of Melk with its immense Baroque Benedictine Abbey. En route to Melk we started the day onboard with a Sunday breakfast of champagne, lox and bagels, buoyed by a huge menu of other breakfast items. I soon discovered both breakfast and lunch on board were always a treat, since they offered a large variety of surprisingly good food. But they were outshone by the dinners, some themed to the areas where we were sailing, which provided an opportunity to sample “local” cuisine. Although three meals a day were provided, whenever possible I ate lunch in one of the towns we were visiting, since it’s a wonderful way to get a great taste of the local cuisine and culture. Food can be just as much a cultural experience as the local museum and cathedral, and sometimes a better one. For example, when we arrived in Regensburg, I made sure to visit Historische Wurtsküche, a tiny 1,000-year-old riverside wurst house I had read about in The Unexpected Pleasures of Medieval Regensburg.In Nuremberg I found another great wurst restaurant where I ate at a communal table with local residents. 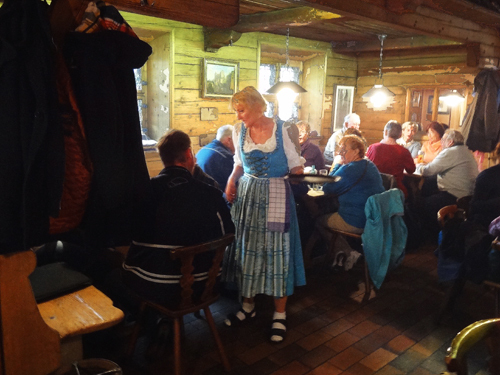 In Bamberg I stumbled upon a wonderful little restaurant where I met some fellow passengers from the Pacific Northwest who shared their family-style meal with me, before we all set out to test some local beers. All along the river I found it incredibly enjoyable to be able to visit places I likely never would have seen otherwise. 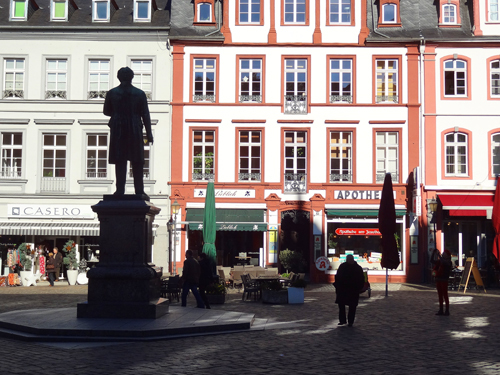 I was surprised at the beauty of many of these little towns and cities, many of which made me feel as if I’d stepped back into medieval Europe. 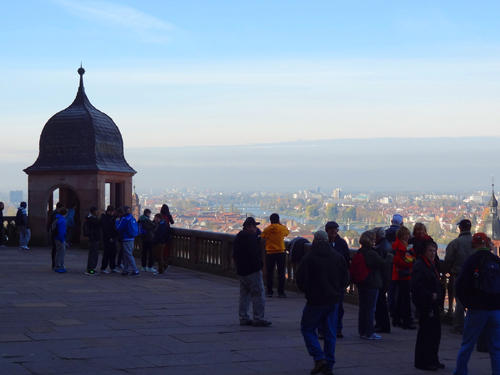 Passau, Regensburg, Bamberg, Wertheim, Heidelberg and a half-dozen others, all whisked me back into other centuries. 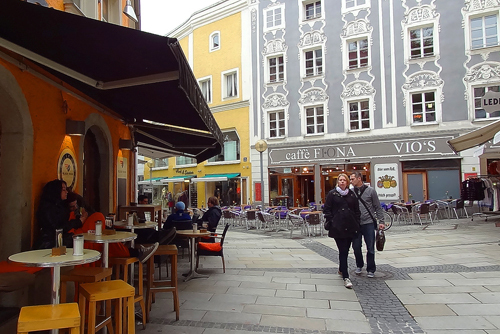 In Passau, for example, I was amazed that the old city was so Italianate in style even though the German town sits on the Austrian border. While its Baroque cathedral has the largest pipe organ in Europe, many people know it instead as a good place to shop, probably because of the many river-cruise ships that stop here. 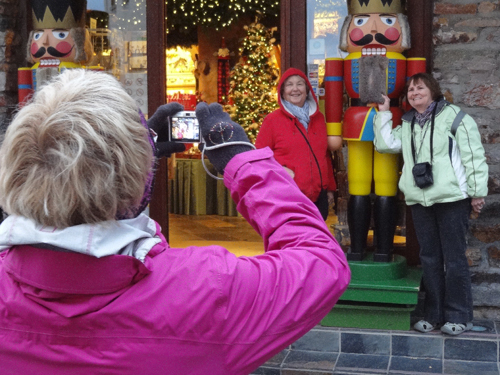 For many, shopping is certainly a part of the river-cruise experience and although the guides onboard do not bring groups into shops, they will suggest good places to shop if you ask. They’re also a font of other information. 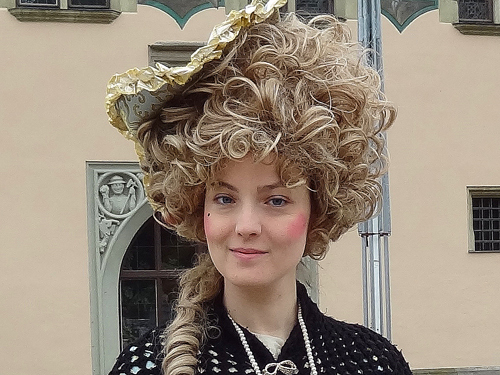 When we arrived in Regensburg I asked Eva, one of our excellent onboard tour guides, for suggestions about visiting the old town. Among her recommendations was a visit to the Café Terrace on the top floor of the Kaufhaus department store where I’d get a great view over the old city and, potentially, a good photo. 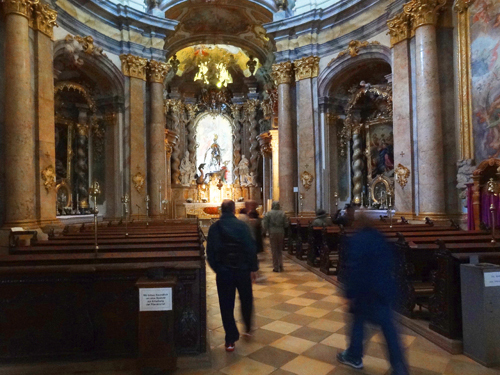 After Regensburg we moved upriver to Kelheim where buses took us on the tour “Bavaria: Baroque and Beer.” It was an optional trip out to the 8th-century Weltenburg Abby, where the plain exterior of the church belied its incredibly ornate interior. The abbey was founded by Irish monks who brought their beer expertise to the area, and the ten that live there now still run the world’s oldest monastic brewery. We couldn’t visit the brewery, but after marveling at the church we boarded a small river cruise boat for a ride through the Danube Gorge, the narrowest section of the river where the large riverboats cannot sail, and sampled the monastic brew. Later that day I joined another tour out to the small town of Beilngries where a dozen of us had coffee and homemade cakes in the home of a local German housewife. It was a two-hour or so optional cultural exchange, a wonderful program in which we learned firsthand about life and culture in Germany, and our host about similar things in the USA. Grand Circle often incorporates cultural exchanges such as this on its tours. We had a historic tour the next day in Nuremberg when we visited Courtroom 600 where the Nuremberg war trials were held. 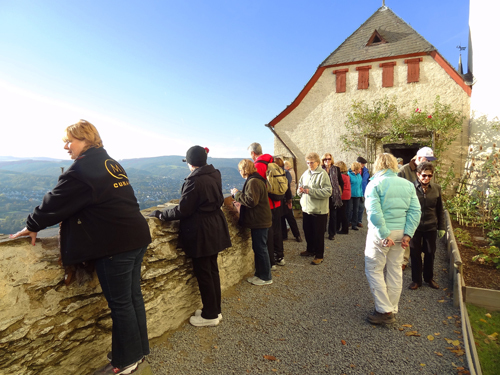 It was a fascinating experience made even more so by our guide, an Englishman who had moved to Germany and whose knowledge made the history of the place come to life. In the afternoon we relived more history at the Documentation Center adjacent to the former Nazi Party Rally Grounds. Set in a historic, austere building, the Center attempts to demonstrate through narration, photos and film clips how Hitler used the propaganda and public relations machines, along with other tactics, in his rise to power. The visit to the Documentation Center was one of five optional tours offered during our voyage, although pre-and post-trip tours are also offered. These optional tours, ranging between $60 and $90 per person, are the most expensive “add-ons” of the trip. 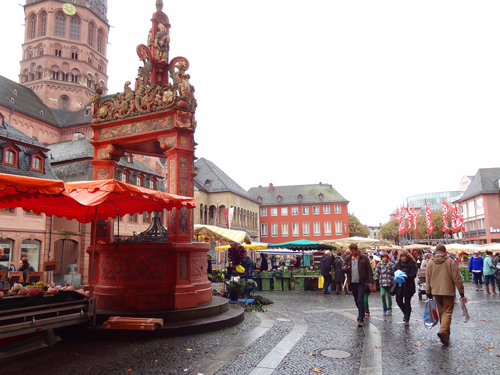 Some of the tours include a stop to sample beer or wine, and a tour to Rothenberg included a good lunch at a restaurant on the central square. We also had one tour onboard in the ship’s small kitchen to chat with the chef, a native of Bavaria, who explained to us how different her job was from working on a large cruise liner. Many in our group peppered her with questions and in the end she offered to provide us with whatever ship recipes anyone would like. The kitchen tour was just one of the many on-board programs provided. Others included a strudel-making demonstration, lessons in “tourist German”, a glass-blowing demonstration, etc., all always augmented by entertainment after dinner, including a karaoke show one evening. I’m not a fan of karaoke but enjoyed this show since not only did various passengers entertain us but also several groups of crewmembers including the entire kitchen staff. The crew is certainly one of the reasons Grand Circle Cruise Line has such a loyal following, since it’s often involved in many of the goings-on aboard ship. From serving you dinner to serving-up comedy skits in the lounge, you can’t help but be endeared to many of the crew whom you come to know. You also get to know many of your fellow passengers, one of the benefits of traveling on a small ship. There are many other benefits, of course, including the overall cost of the cruise, which I was told by other passengers – who had taken previous cruises both with Grand Circle and its competitors – is a great value. I was surprised by the value provided by onboard amenities such as laundry service, which I had expected would be higher. Still, though, the greatest value for me was the ability to step-off ship right in the center of a city near many places of interest, which allowed me to make my own schedule and not be tied to that of a tour organizer. River cruising may not be for everyone, especially if you enjoy an onboard pool, a multitude of restaurants and the spaciousness of a large ship. On the other hand, it does immerse you in the history and culture of an area, often deep within a country or continent for days or weeks at a time, a benefit impossible to replicate on a large ship. And there are also those hard-to-define benefits, as well. One was the Autumn morning when I stood on the sundeck with several others, watching smoke wafting up from chimneys along the shore, every now and then catching a whiff from a fireplace, as the Harmony moved silently up the Main. Another was viewing the castles along the Rhine that burst up out of vineyards that ran down to all the little towns scattered along the water’s edge. And there was the quiet morning on the Danube where parts of the river were covered with fallen October leaves, as if someone had strewn golden petals on the water for us as we slid soundlessly by. The greatest benefit for many travelers, however, is certainly the personal nature of the journey. After two weeks and 932 miles you know you’ve experienced something that can’t be easily replicated. My cruise on the MS River Harmony was sponsored by Grand Circle Cruise Lines. As always, however, all of the views and opinions expressed are strictly my own – J.F. Spring, when the ships go back into service, cannot come soon-enough for me! I’m looking at a wine-themed river cruise OR the tulips river cruise (which only runs a couple of weeks a year). There is nothing like stepping off the ship into the heart of a 1,000-year-old city …. I smiled at Kaufhof …. that’s where I do my Regensburg grocery shopping for beer! So that’s why the shelves were empty! Now, that was funny, Jim! I bring home beers from 400-year-old braus for my husband … it’s an adventure for him! Great review Jim. I think river cruising is absolutely the finest way to travel. I have not cruised with Grand Circle because I have heard some less than complimentary reviews but maybe they have improved their service in the last couple of years. Certainly sounds like it from your review. Ray Biller … Hi, Ray … it was so nice to see your comments here! I know you share our passion for river cruising! I velieve you had a December river cruise, didn’t you? Thank you Ray. I’d rate my cruise A+, as many readers of Conde Nast seemed to do as well. Be sure to read the first article in the series — River Cruising on the “Best in the World” — to see why we rated Grand Circle so highly.